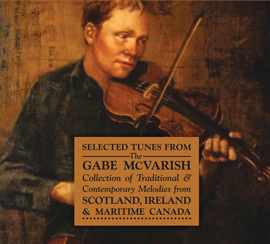 "This is a collection of over 170 tunes from the Celtic musical traditions of Scotland, Ireland and Maritime Canada, compiled (and in many cases, penned) by renowned fiddle player, Gabe McVarish. "Seo agaibh ach cruinneachadh de chòrr is 170 puirt bho dhualchas Ceilteach na h-Albann, Èireann, agus Tìr nan Craobh, air an cur ri chèile (agus sgrìobhte às ùir a thuillidh air sin) leis an fhìdhleir, Gàb Mac Mharuis. Tha na puirt a riochdachadh iomadh gnè de cheòl bho fuinn nan òrain Ghàidheralach do, waltzes, caismeachdan, puirt Shrath Spè, Ruidhlichean is puirt-dhùbailte. Riochdachaidh na puirt seo eisimpleir beartach den cheòl a chluinnear gu cumanda aig seiseanan ciùil air feadh Àird an Iar na h-Albann, a tha cuideach a' glèidheil na ceangalaichean le ceàrnaidhean is slughanan fad às, a roinn na puirt seo am measg a chèile bho Alba do dh'Èirinn do Cheap Breatann agus eile. Cruinneachadh Ghàib 'ic Mharuis de Phuirt; Ùr is sean à Alba, Èirinn is Tìr nan Craobh." 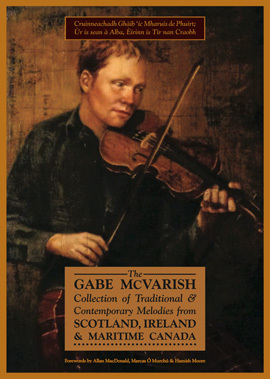 "This album was recorded as an audio companion to the Gabe McVarish Collection of Traditional & Contemporary Melodies from Scotland, Ireland & Maritime Canada. Recorded in 4 sections, the first section demonstrating Scottish tunes from the Collection with guitar accompaniment from Euan MacPherson, the second with Irish tunes accompanied by Aaron Jones on the cittern and the third exhibiting Maritime Canadian repertoire with Mac Morin playing piano. The fourth section features sets combining tunes from all 3 genres with all 3 accompanists representing their respective styles along with me on the fiddle. All the tunes on this album are transcribed in the Collection and have been recorded as clearly and accurately (to the transcriptions) as possible. I hope it proves useful to those endeavouring to learn tunes from the Collection and enjoyable as a stand-alone recording for those who aren’t!